This two-volume handbook offers a thorough treatment of theconcepts and theoretical developments concerning how to applycultural knowledge in theory and practice to various racial andcultural groups. Robert T. Carter, Ph.D., is a professor of Psychology and Education at Teachers College, Columbia University. He is also a member of the graduate faculty of Columbia University's Graduate School of Arts and Sciences. 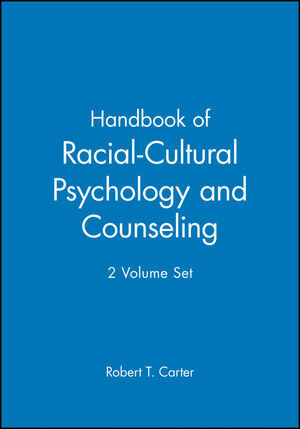 He is author of The Influence of Race and Racial Identity in Psychotherapy: Towards a Racially Inclusive Model (Wiley) and other books. Uprooting Inequity and Disparities in Counseling and Psychology:An Introduction (Robert T. Carter). PART I: Core Racial-Cultural Concepts, Ideas, andTheories. 1. The Importance of Cultural Psychology Theory forMulticultural Counselors (Paul Pedersen). 2. Culture, Context, and Counseling (Sam D. Johnson Jr.). 3. Ethnicity: The Term and Its Meaning (Heather L . Juby andWilliam R. Concepción). 4. Race: A Social and Psychological Analysis of the Term and ItsMeaning (Robert T. Carter and Alex L . Pieterse). 5. The Role of Racial and Cultural Constructs in the History ofthe Multicultural Counseling Movement (Madonna G. Constantine andLeo Wilton). 6. The Socialization of Self: Understanding Shifting andMultiple Selves across Cultures (Christine J. Yeh and Carla D.Hunter). 7. The Inf luence of Cross's Initial Black Racial IdentityTheory on Other Cultural Identity Conceptualizations (Madonna G.Constantine, Sherry K. Watt, Kathy A. Gainor, and Anika K.Warren). 8. Racial Salience: Conceptual Dimension and Implications forRacial and Ethnic Identity Development (Kwong-Liem Karl Kwan). 9. The Integration of Spiritual and Religious Issues inRacial-Cultural Psychology and Counseling (Timothy B. Smith and P.Scott Richards). PART II: Critical Issues in Racial-Cultural Research,Measurement, and Ethics. 10. Cultural Psychology: Its Early Roots and Present Status(Juris G. Draguns). 11. The Role of Socialization in Cultural Learning: What Doesthe Research Say? (Benjamin P. Bowser). 12. Acculturation: Current and Future Directions (Eric L .Kohatsu). 13. Work: Cultural Perspectives on Career Choices and DecisionMaking (Nadya A. Fouad and Angela M. Byars-Winston). 14. Psychotherapy Process and Outcome from a Racial-EthnicPerspective (Jairo N. Fuertes, Catarina I. Costa, Lisa N. Mueller,and Mindy Hersh). 15. Race and Research Evidence (Chalmer E. Thompson, Caroline E.Shin, and Joy Stephens). 16. Psychological Functioning and Identity Development ofBiracial People: A Review of Current Theory and Research (Marie L.Miville). 17. An Inquiry into the Measurement of Ethnic and RacialIdentity (Joseph E. Trimble). 18. Challenging Some Misuses of Reliability as Ref lected inEvaluations of the White Racial Identity Attitude Scale (WRIAS)(Janet E. Helms). 19. Racial-Cultural Ethical Issues in Research (Farah A. Ibrahimand Susan Chavez Cameron). 20. 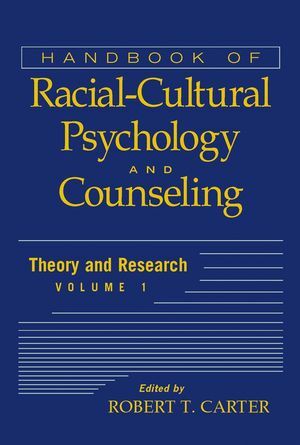 The Decline of White Racial-Cultural Dominance in Counselingand Psychology: A Summary and Reflections on the Impact of MultiplePerspectives (Robert T. Carter, Alex L . Pieterse, and BryantWilliams).